2019-07-20 Boogie, Beehives & Beyond! Time: 6:30 PM — 8:00 PM. Date: Tuesday of each week between 2018-01-30 and 2025-01-30. Great Lakes Recovery Center provides Peer Support Services in the Newberry area. Peer Support focuses on providing an environment where people from the community, who are living in recovery, work with people who are currently receiving treatment for a substance abuse disorder. These Community based Peer Recovery Specialists serve as a resource and support system for others who are currently in treatment and who are living in recovery. Group meetings 6:30pm-8:00pm, individuals are by appointment. Call (906) 632-9809 to schedule or 906-293-1622 for more information. Every Third Thursday from 19 Oct. 2017 to 31 Oct. 2019. For More Information Call 293 5631. Click here for complete information. Every Third Tuesday from 15 Jan. 2018 to 15 Jan. 2025. Every Last Monday from 29 Jan. 2018 to 29 Jan. 2021. Every Second Monday from 29 Jan. 2018 to 29 Jan. 2025. First Baptist Church Baby Pantry, 2nd & 4th Monday of each month, 11am-1pm at The First Baptist Church, 116 E. McMillan, Newberry. Use entrance off Handy St. For parents of children ages 2 and under. For more information call 906-293-5641 Tuesday-Friday from 10am-noon. Every Fourth Monday from 29 Jan. 2018 to 29 Jan. 2025. In the Commissioners Room of the Luce County Government Building, 407 W. Harrie St.
Every Last Monday from 29 Jan. 2018 to 29 Jan. 2025. Every Third Monday from 29 Jan. 2018 to 29 Jan. 2025. The Luce-West Mackinac County Fair Board meets the 3rd Monday each month at 6pm in the basement of the Newberry Community Building, 405 Newberry Avenue, Newberry. For more information call 293-8785 or 293-8955. On Tuesday from 30 Jan. 2018 to 30 Jan. 2025. On Thursday from 1 Feb. 2018 to 1 Feb. 2025. T.O.P.S. (Take off pounds sensibly) meets at St. Gregory's Catholic Church in Newberry at 10:00am. Weigh in from 9:00-10:00am with meeting following. Cost is very little. Mem, women, and teens are welcome. Call 293-5785 or 293-1510 for more information. Newberry American Legion Post 74 will be hosting Euchre, 6:00 pm. Public welcome - minimal entry fee. For more information call The Newberry American Legion Post 74 at 293-8711. Every First Monday from 5 Feb. 2018 to 5 Feb. 2025. The Lions Club meets at Zellar's Village Inn the 1st and3rd Mondays each monthat 6pm. For more information call Sharon Lemaire at 293-3020. Every Third Monday from 5 Feb. 2018 to 5 Feb. 2025. Every Second Monday from 6 Feb. 2018 to 6 Feb. 2025. The Luce County Parks and Recreation Department Board meets the 2nd Monday each monthat 4:30 in the Commissioners Room of the Luce County Government Building, 407 West Harrie Street, Newberry. Every First Wednesday from 7 Feb. 2018 to 7 Feb. 2025. Come welcome new businesses to Newberry. Every Second Thursday from 8 Feb. 2018 to 8 Feb. 2025. The Newberry American Legion Post 74 meets the 2nd Thursday each month at 6:30pm at The American Legion on M-123. Pot luck starts at noon, meeting follows at 1PM at the Senior Citizens center across from Rahilly's IGA. Every Second Wednesday from 14 Feb. 2018 to 14 Feb. 2025. Held at the Library at TAS. Every Third Monday from 19 Mar. 2018 to 19 Mar. 2020. Village of Newberry Council Meeting. 3rd Monday of every month at the Village offices in Newberry. Join us in Newberry, MI on April 18th to meet with potential employers at the 2019 Michigan Works! Job Fair! Whether you're looking for your first job, or you're looking to change careers, you'll enjoy the abundance of resources and networking opportunities at the Job Fair. TLC Youth Mission fundraiser. Please help send our youth on missions. Neck & back massage, hand salt scrub massage & paraffin dip, foot bath & salt scrub massage, nail polish & art, facials, spa drinks & Hors D'oeuvres, raffle baskets, and more! Only $20! Pay when you arrive. Come in for a little pampering and Tender Loving Care at TLC. For more information, please call the church at 293-9340. Children must be accompanied by an adult. Invite your friends and neighbors! 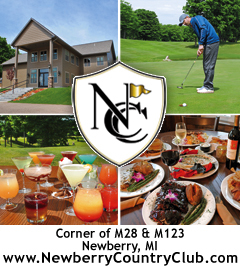 The North of 45 Retreat for Writers will celebrate its 10th year May 2 � 5 in Curtis, MI with its primary sponsors, Chamberlin�s Ole Forest Inn and the Erickson Center for the Arts, hosting. Additional support comes from local, regional, and individual sponsors. The all-inclusive retreat features workshops taught by notable authors to challenge and encourage writers of all genres and levels of experience. Participants have opportunities to read their work aloud and receive feedback from their peers that is both affirming and constructive. North of 45 Retreat attendees enjoy stretches of time to relax, write, or simply enjoy the company of other writers. Leading workshops for the May 2019 event will be Rob Ritchie and Amanda Zieba. his luau fund raiser for the Hawaiian Association of Authentic Leis (HAAL) can't help but turn deadly with so many nefarious characters in attendance! Get your tickets online NOW and save $5! Go to https://mynorthtickets.com/events/murder-mystery-dinner-theatre and type in the early access code: WHODUNNIT.